learn to keep the hook and read circuit. 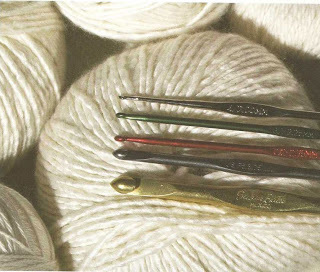 It would seem that, which can be tools for crochet, except the hook and thread, and nothing is easier, than to pick up the necessary material. In fact, varieties of hooks enough. They differ in material manufacturing, application, as well as the shape and length. Therefore, in order to learn how to crochet is quite important to know what all the same hooks are, to subsequently pick up correctly for themselves the necessary tools. For wool. For this type of yarn used hooks thicker and rounded. For cotton yarn. These hooks are rather thin, and at the ends sharper. For Tunisian crochet used a long hook. The length of an ordinary Tunisian hook is, equal of 30 to 50 cm, but other than that this tool is attached with fishing line, then its length is from 15 to 20 cm, as well as a special cable, in this case its amount is almost equal to normal - from 12 to 15 cm. Knitting on the plug. For this type of knitting in addition to the hook, and used a special tool, called fork. With this method usually knit braiding. plastic. The advantages of such hooks is a smooth and even surface, but the biggest drawback ability to electrify the yarn and knitted fabric. Kostyanыe. Such hooks are very convenient because of its light structure and a smooth surface, so they are used for a long time. The disadvantage is that the bone hook, he wears out quickly. true, currently it is made from more durable materials, but that its price increases significantly. metal. These hooks are in turn can be made of the following metals: nickel, aluminum, steel. The advantage of all metal hooks is, that they are not electrified and good quality do not have rough edges. The best types of nickel and steel hooks, disadvantage is that the aluminum, that they quickly lose their shape and are able to leave behind traces, both hands, and on the product. wooden. hooks, made from this material is also good for its ease and convenience, but their significant drawback is, they are very perishable, and the surface is most often rough, so that can go wrong with knitting yarn. needles varying thickness, for stitching future product details. 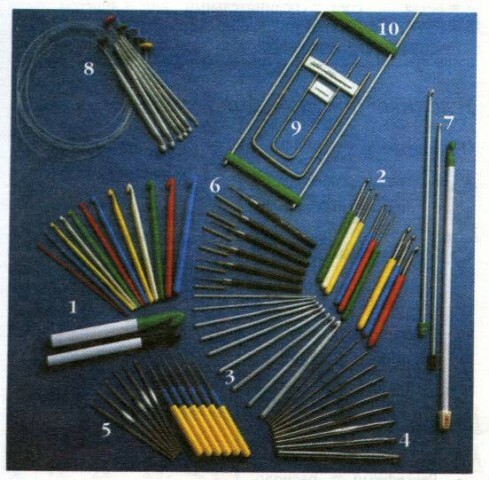 Pins for fastening, they are applied, if necessary, stretch fabric, or to make it easier to connect the parts with a hook or a needle. Scissors. This auxiliary tool is better to take with sharp ends. Next, consider the, how to learn to knit a simple hook. Shape of the upper part of the hook, that is, its head should not be too severe, since such a tool can injure hands and spoil thread, but not too rounded, to hook it easier to pull the thread from products already vyvyazannyh loops. The rounded tip of the hook or beard should be sufficiently rounded, to easily capture and hold the thread, without spoiling its. For convenience, you can also take the hook, having a slightly flattened portions on the rod, located closer to the head. Such a hook is more comfortable to hold in the hands. Hook and thread are selected depending on how the product will be in the future. For summer and fishnet veschichek needs a more subtle hook and cotton thread, and for the dense and warm taken, eg, wool yarn and hooks with a large diameter rod. Properly selected hook should be in two or even 2,5 times thicker thread. Most often on the ball of the hook indicated number, which you must use for each individual thread. But to determine the appropriate size and can be independently. For this purpose, the thread formed in two additions and compared with the thickness of the selected hook. If the hook is properly selected, its thickness and the thread must match, or be in 0,5 times more. Otherwise, If the hook is set too thin, the product will be more dense, and if thick, it is too loose. If you are just beginning to learn to crochet, the thread is better to take the light for, better to have all the tabs are visible. 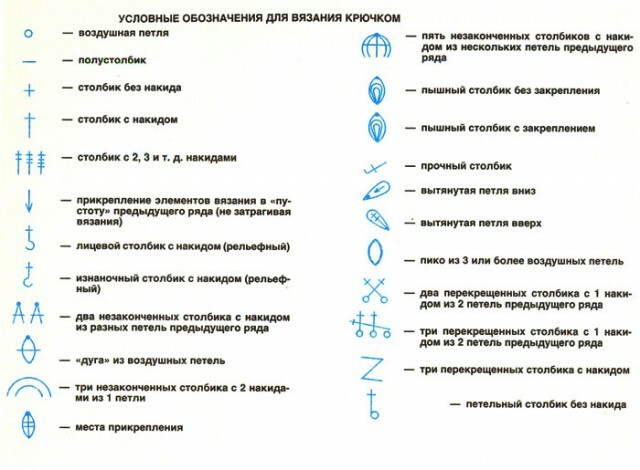 Also, do not take a thread, started a few additions or colors, eg, melanzhevыe, since in the first case, the thread may delaminate, and in the second it will be bad image appears. The hook is in the right hand, and you must keep it as a pen or pencil. Top hook throughout the knitting must be turned to him. Working thread is thrown through the index finger of the left hand, so that its end, leading to tangle located inside the palm of your hand and was passed through the finger. Fabric knitting sticks thumb and ring finger. When knitting loops, thumb sticks to the free end of the thread, and missed the rest of the thread between the fingers, so as to create small tension and all the tabs are given the same size. Middle finger, if necessary, and for convenience can be maintained and the loop or loops, are on the hook. Properly dispose thread and hook. Hook injected under the working thread, located on the index finger, in the direction from right to left. Then hook with thread to rotate so, so that it formed a loop, and threads crossed with each other. Then, holding the loop below the thumb, hook again in the same way introduce a working thread, located on a finger of the left hand. Then the thread is stretched and pulled through the first eyelet, located on the hook. Knitting the loop continues in the same algorithm, until the chain will not get the desired length. It is important to try to do loops of the same size chain, to the edge of the product was more beautiful. Also, do not pull them too, otherwise it will be difficult provyazyvat chain in the following series of loops, as well as doing too large, that edge is not stretched and does not even. Next row is knitted according to the selected pattern of future products, but you must first learn knit columns different types of: polustolbiki, columns with and without sc sc, relief, lush, and so on. Many fashion magazines and popular books is often a process of knitting products is presented in the form of a special scheme of incomprehensible at first glance characters, and detailed instructions to them more often than not attached. Therefore, do not learn to understand in places like the icons. Read circuit really is not difficult, the more so because most of them are attached to the characters denote, they consist of. If the loop is repeated at an interval of several, on this site signs the report, in which both describes the type and number of loops. Anyway, before proceeding with the knitting pattern of complex according to the scheme, it is necessary to carefully disassemble. And mastering the art of knitting on set pieces and subsequently, if desired, include a little to your imagination can start to invent and write down their. 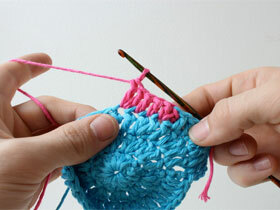 Learn to crochet is not difficult, so feel free to get down to business!